But where will it slot in the G-Class lineup? Earlier we reported that Mercedes-Benz was thinking about bringing the insane G-Class 4x4 Squared to the US. Mercedes was unable to sell the 6x6 stateside because of numerous hurdles getting it to conform to US standards. The 4x4 Squared was much easier to get approval for, so now US off-road enthusiasts will be able to purchase the most badass G-Class that Mercedes currently offers. The car is based on the standard G550 but now has more than 17-inches of ground clearance. Like the 6x6, the 4x4 Squared features off-roading components such as portal axles, adjustable shocks, stabilizer bars, and three locking differentials. The G550 4x4 will be powered by a 4.0-liter Biturbo V8 with 416 hp and 450 lb-ft of torque. Mercedes has not announced where this car will slot in the G-Class lineup. The SUV will definitely cost more than the base G550 ($119,900), and may slot below the AMG-tuned G63 ($139,900). 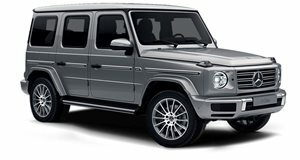 The current top-tier G-Class is the G65 ($217,900), but the G550 4x4 Squared could change that. Where ever it slots in the lineup, this new G-Class will be the best off-road car available in the US and quite a nice car to show off in LA with.